How well did my students do in their examinations this summer? I spent most of my researchED 2015 session exploring my students’ 2015 results and trying to answer this question so that I can improve my teaching next year. 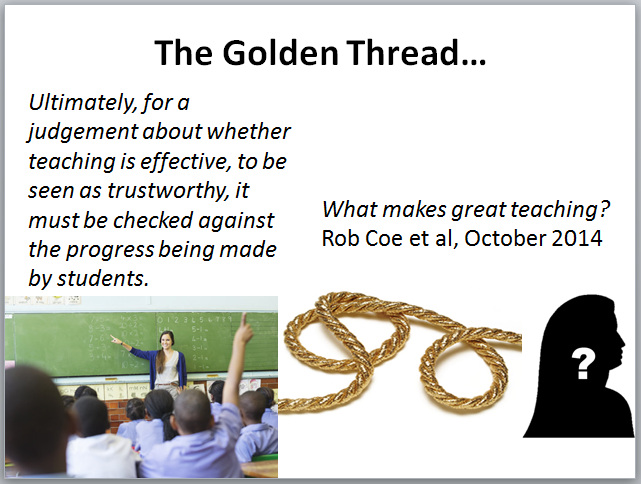 There is a golden thread running from my teaching through to my students’ examination results. Whatever I did to try to improve my teaching last year will manifest itself in the data from this summer’s results. Summer 2015 is over, but if I do not spend time analysing forensically my students’ examination results, then I forgo the opportunity to learn about the impact of my last year’s teaching. If my modifications to my teaching worked, evidence that they worked will be there in the examination results; if they didn’t, the results will tell me and I should stop doing whatever I am doing. Click on the slide below for my presentation. Do email me if you want to ask any questions. Thanks again to Tom and Hélène for organising a fab conference. It was a privilege to be involved. Hi – I cannot seem to access slides either? Thank you. I find your approach so refreshing, John. I met someone this week and when I asked how summer results has been she wrinkled her nose and said, “Well, not great, but as I expected.” I can remember making the same response earlier in my career. How much more powerful is it to look at results and think: what can I learn from this that will help me, and future cohorts, do even better than this year? ‘How can we?’ rather than ‘why we can’t’…. I know it’s easy for me to say this now, but if we have a critical mass of teachers who take the ‘How can we?’ approach, I do think the profession could move mountains.